Revised planets in Discovery are not discussed here. Please refer to The Visual Continuity of Star Trek. Recurring planets do not always look the same. 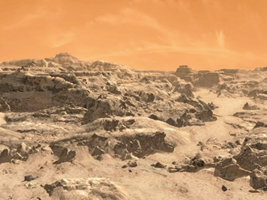 Cityscapes, skies and even the overall colors of the planets are subject to vary. This article investigates the changes and attempts to find explanations. 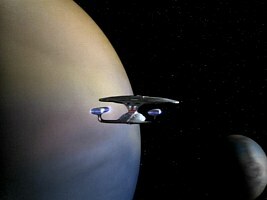 During The Original Series (TOS) Spock's home planet appears twice. 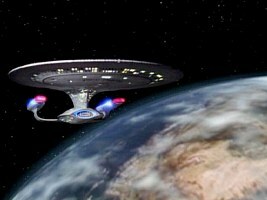 The first time is in TOS: "Amok Time" when we can see Vulcan from the orbit as well as from the ground. 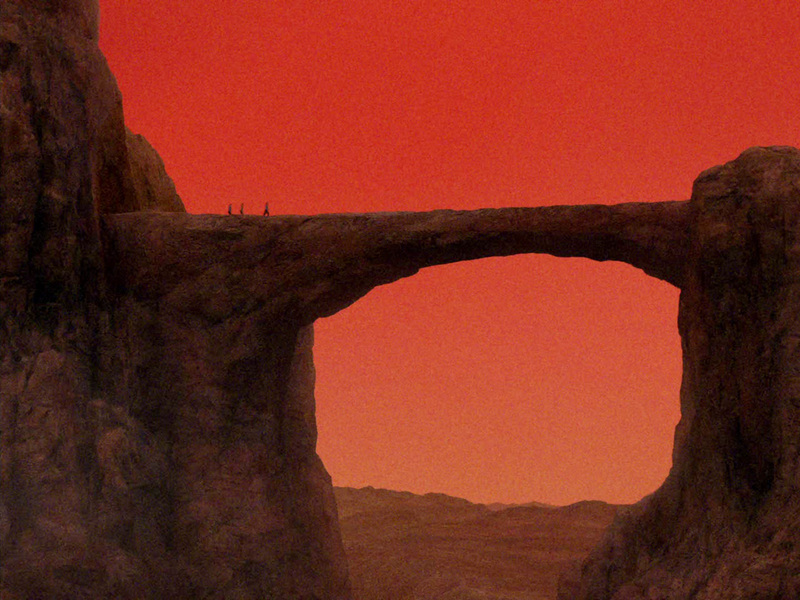 As perceived from the surface, Vulcan is a desert planet with an intensely red sky. The sky may appear red for two reasons. The first possibility is that the long-wave portion of visible light coming from the Vulcan sun is predominant; in other words, the sun itself is red. The sun is not visible in the sky in this episode. 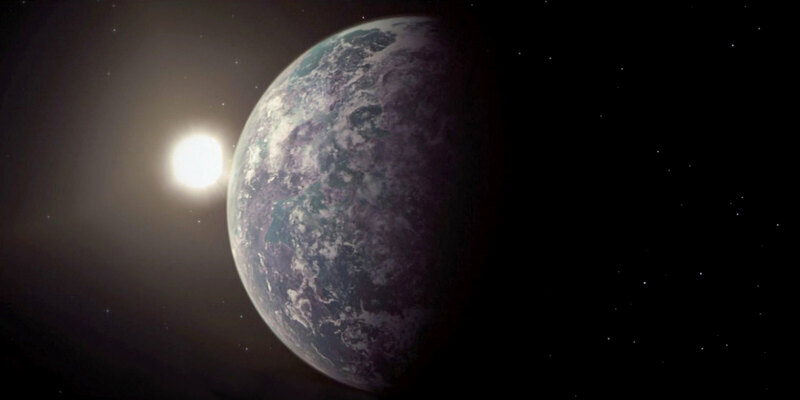 Alternatively or in addition to that, the atmosphere may be thicker or denser than on Earth or even very polluted, thereby filtering out most of the green and blue portions of the incident light. We can observe the very same phenomenon on Earth near sunset when most of the blue light has already been scattered in the atmosphere (making the sky blue in regions where the sun is still far above the horizon). The remainder we see at dusk is red-shifted. 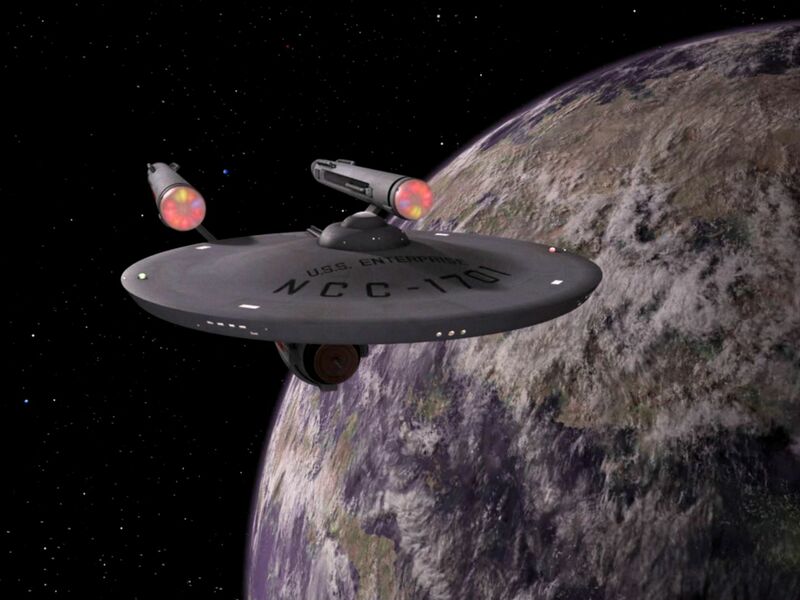 We know from "Amok Time" that the air on Vulcan is supposed to be thinner than on Earth though. 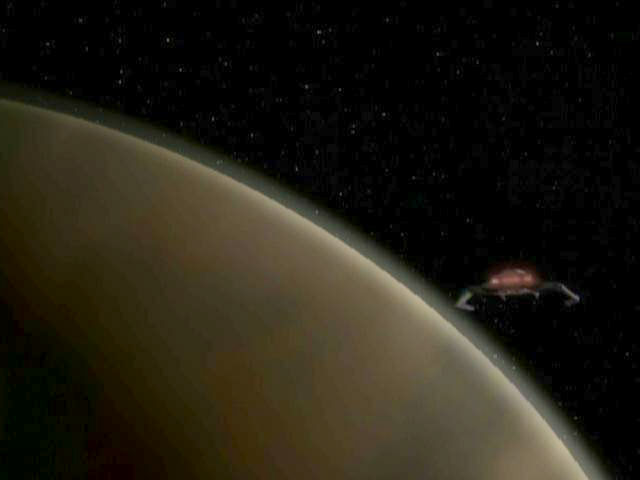 Vulcan in TOS: "Amok Time"
Vulcan surface in TOS: "Amok Time"
Vulcan's overall color as seen from the orbit in the same episode is the same red as the sky, with some blurred brighter features, possibly representing clouds. There is, however, no reason why the color of the sky should be the same or very similar to the planet's color in space. The first is a result of the already mentioned atmospheric dispersion and scattering, while the latter includes the reflection from the surface, which is obviously predominant in the case of Earth. 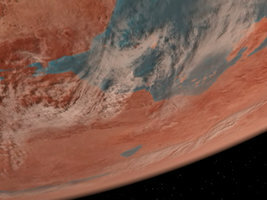 The filtering in the atmosphere would rather not let Vulcan appear red from space, for the simple reason that the red light would be rather transmitted through the Earth-like Class-M atmosphere than scattered back into space. 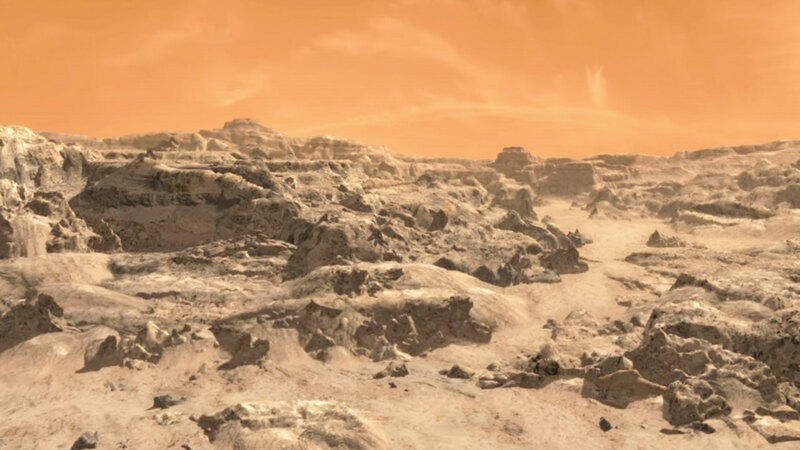 Yet, in addition to the aforementioned spectrum of the central star we can ascribe Vulcan's color to a mostly red soil without much vegetation, which would otherwise appear as dark green areas. Likewise, there is nothing like an ocean visible which we should be able to recognize as sharply delimited darker areas. There is one problem with the spectrum of the star's light, however. 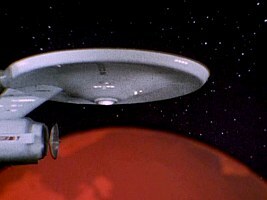 If red light were dominant, we would expect the Enterprise on Vulcan's day side to be reddish too even with a fair amount of self-lighting. 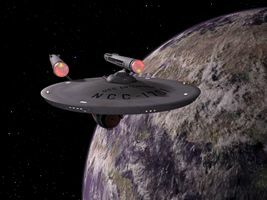 But we may take this as artistic license or visual shortcoming because in TOS the USS Enterprise NCC-1701 is always the same gray under all lighting conditions. Stock footage of the Enterprise orbiting Vulcan appears in TOS: "Journey to Babel", hence not revealing anything new. The takes of the planet Vulcan from TOS: "Amok Time" were also used for Gamma Trianguli VI in "The Apple", Tycho IV in "Obsession", Melkot in "Spectre of the Gun" and Memory Alpha in "The Lights of Zetar". 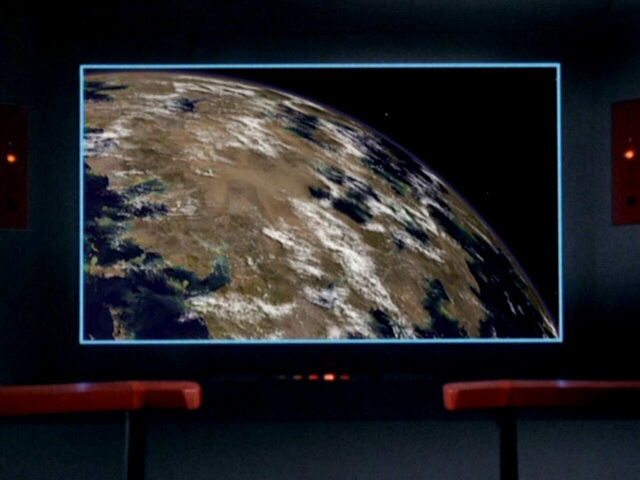 In the first three episodes the planet surfaces are visible too. They are red like on Vulcan. 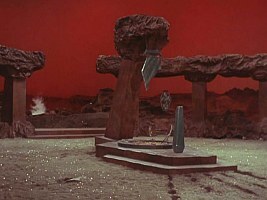 TOS-R: "Journey to Babel" is the first remastered episode to show new shots of the planet Vulcan, owing to the now jumbled airing order relative to "Amok Time". 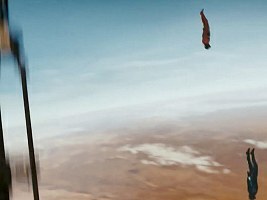 We can see Vulcan in space from in three shots. 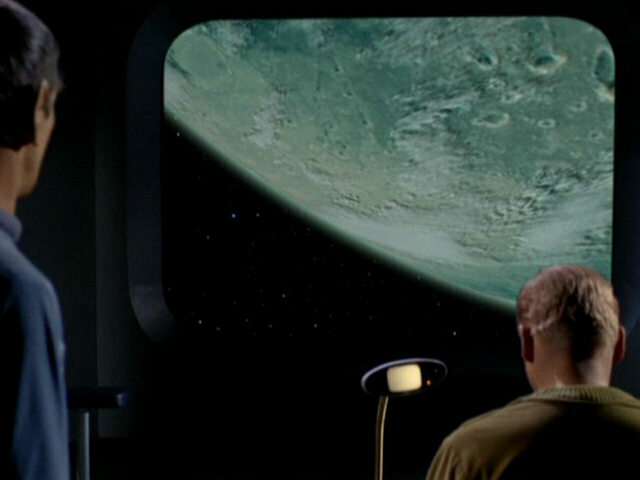 Here the planet looks much like in the movies and in Enterprise, not by far as red as in TOS or as ochre as in TNG. 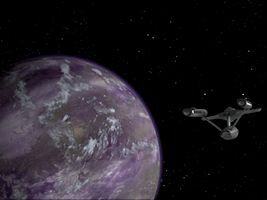 Vulcan in TOS-R: "Journey to Babel"
For the remastered version of TOS: "Amok Time" additional CGI shots of Vulcan's surface were created. 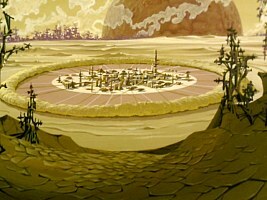 The arena is located atop a tall rock, inspired by "Star Trek III", with the city of Shi(r)Kahr, inspired by TAS: "Yesteryear", in the background. The sky seems to be just as red as in the original episode, probably because the background (sunset?) in the live-action scenes was to remain the same in the remastered episode. 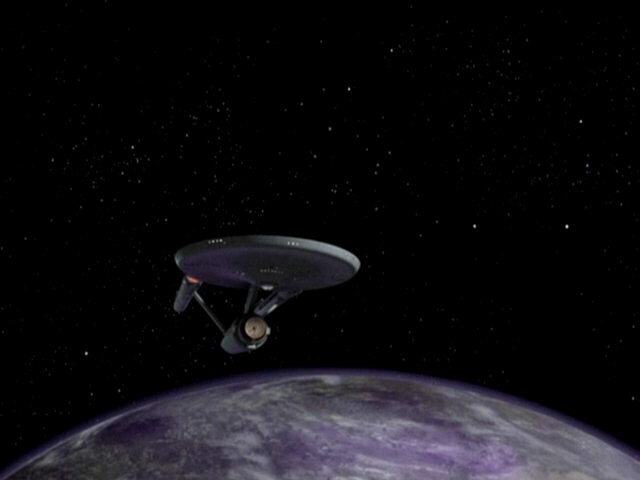 Vulcan surface in TOS-R: "Amok Time"
The planet Vulcan is shown in TAS: "Yesteryear". Unlike the very pronounced reddish hue of TOS, the color of the soil and of the sky is overall rather yellow here. Since TAS generally does not have a good color fidelity, we can ignore this discrepancy. 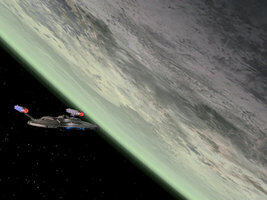 Vulcan surface in TAS: "Yesteryear"
We don't see a total view of the planet from orbit, but Vulcan's surface and sky looks considerably different in "Star Trek: The Motion Picture". We are even dealing even with two very different versions of the planet in the original theater release (two huge celestial bodies, clear black sky as if there were no atmosphere, no definite red hue) and the Director's Cut (no moons, dirty-looking ochre sky, overall ochre hue). 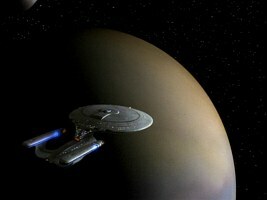 Either of the two alternative movie versions clashes with the red planet we have seen in TOS. 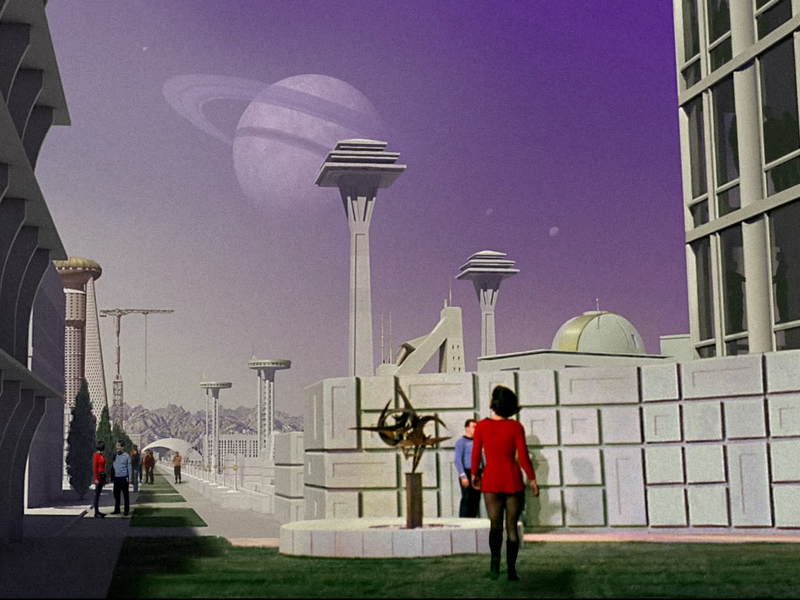 Since the sun is not visible in TOS: "Amok Time", we may attribute the red sky in this episode to special lighting conditions like they occur just before sunset on Earth too, assuming that the sky is normally not quite as red and also brighter. 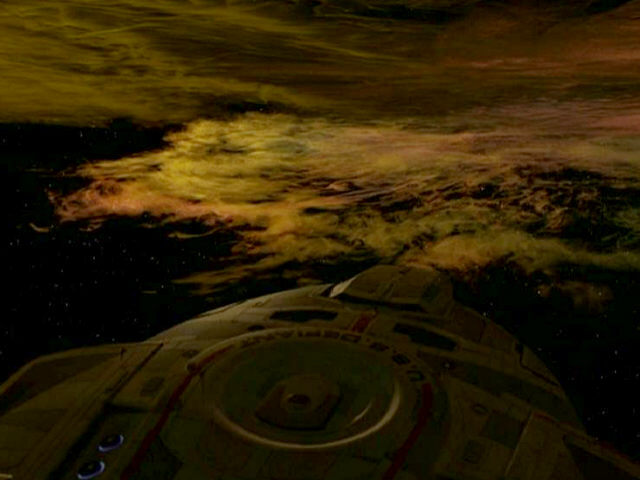 The dim sky in the Director's cut of "Star Trek I" may be due to the clouds, while the sun is still fairly above the horizon. 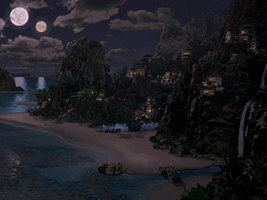 The dark sky in the theater version, on the other hand, is a clear sign that it is night on the planet, while the huge moon (that Vulcan is not supposed to have) still provides a fair amount of illumination. Still, in neither case it can be explained why the planet can be overall bright red in TOS (practically on the whole daylight side) when the sun (in the Director's Cut), the sky and the surface as seen from the ground in the movie are only remotely red. At least I can't think of a scenario with real physics that could account for the diverging colors. Vulcan is red again in "Star Trek III: The Search for Spock". But the red color was considerably toned down for the movie. On the other hand, we now see the border between the day and the night side, so the contrast if much higher than in TOS: "Amok Time". 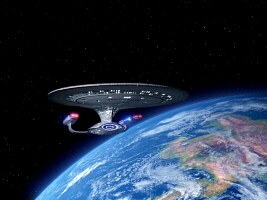 Overall, it is believable that it could be the same planet as in TOS. 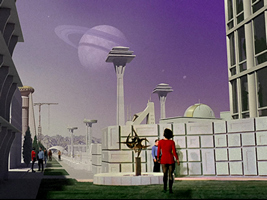 The sun and the sky in the ground scenes of "Star Trek III" as well as "Star Trek IV" are rather yellow than red. 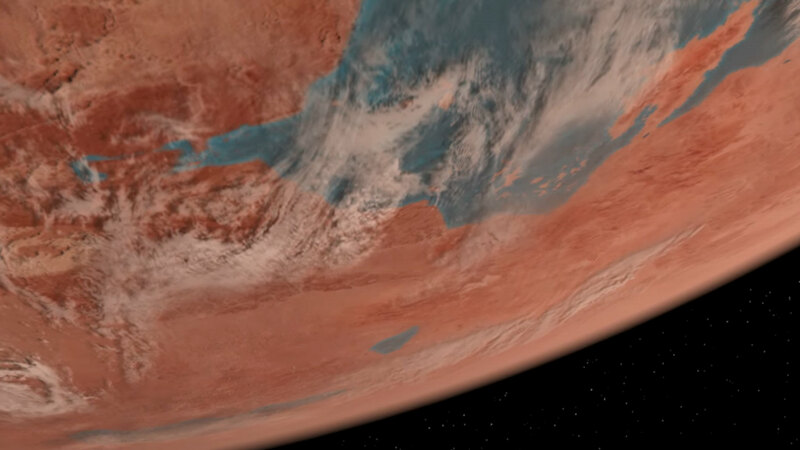 Yet, the red rocks may explain why the planet appears to be overall red, although we must concede that Vulcan is most likely not so geologically homogenous that it would be covered with red rocks or rubble all over. 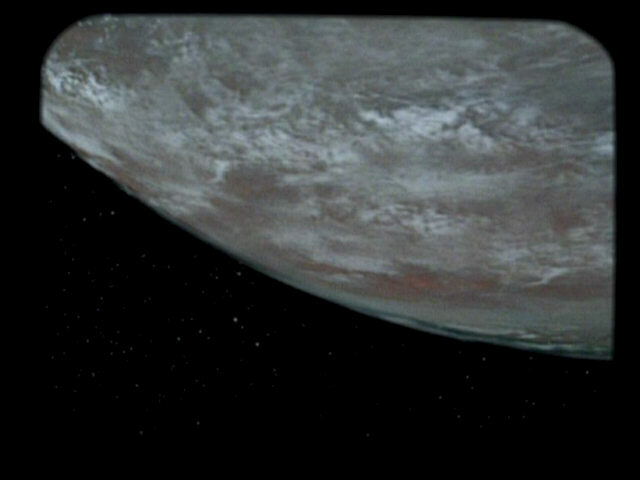 While the rocks in the second view of the surface from "Star Trek IV" may appear yellow because of the lighting, later views from Enterprise reveal that there are large areas of ochre or brownish rocks. 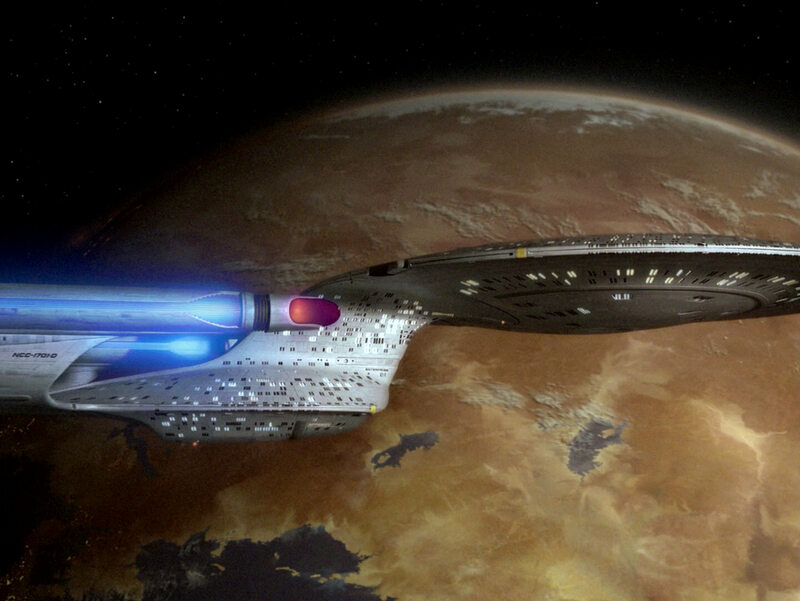 Vulcan in "Star Trek III"
Vulcan surface in "Star Trek III"
Vulcan surface in "Star Trek IV"
In TNG the planet is always ochre on the day side, in clear contradiction to TOS and even to "Star Trek III". There is no way to rationalize this, unless the spectrum of the star or the condition of the atmosphere and soil had radically changed in the 80 years since the TOS movies. Different newly filmed takes in TNG: "Sarek" and TNG: "Gambit, Part II" consistently show us this "re-imagination" of the planet Vulcan. 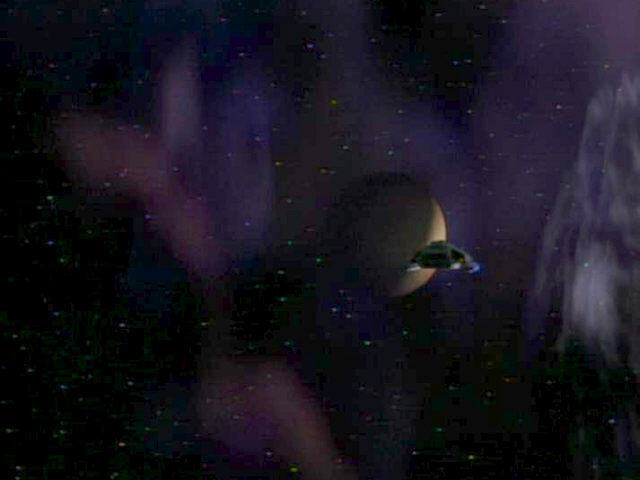 Vulcan in TNG: "Gambit, Part II"
For TNG-R: "Sarek" yet another CG planet was built to appear as Vulcan. 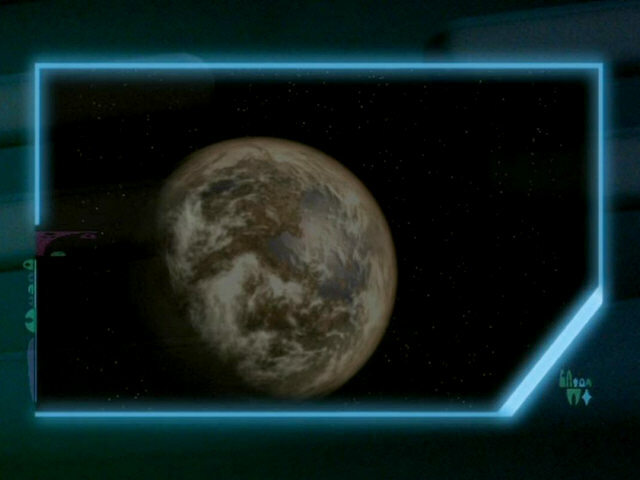 It retains the rather brownish color of the original planet model of TNG, while it includes oceans like those in Star Trek Enterprise. 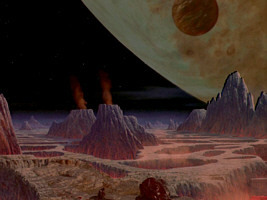 The Vulcan surface in VOY: "Persistence of Vision" is represented by the same matte painting as in "Star Trek IV" and has essentially the same colors. If we didn't expect the rocks in this region (around Mt. 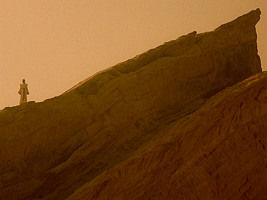 Seleya) to be red, the landscape would match the planet's appearance in TNG. 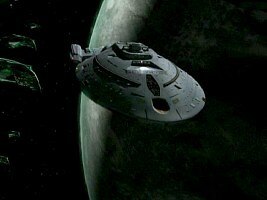 The whole scene in the Voyager episode is just a hallucination, but we may assume it is a realistic one. 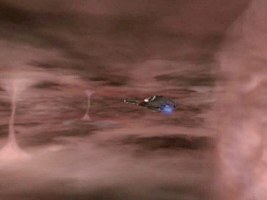 Vulcan surface in VOY: "Persistence of Vision"
In Enterprise Vulcan is a red planet again. 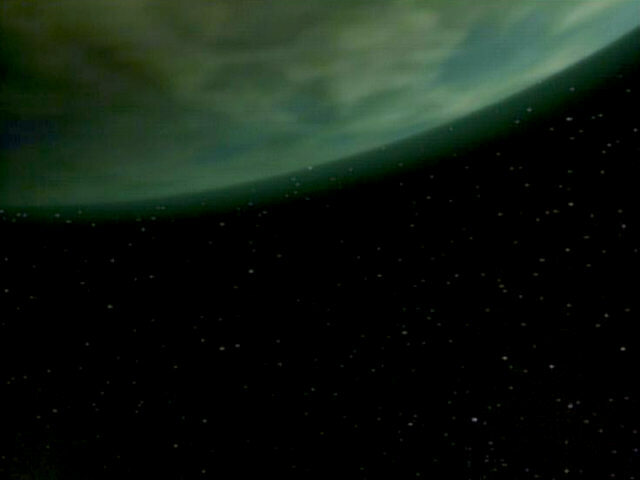 As seen from orbit the planet is only a tad paler than in TOS. 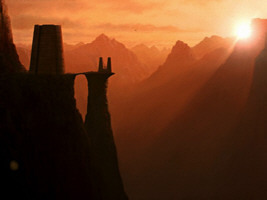 We can see some darker areas of vegetation and most likely bodies of water that were not visible in TOS or the movies. The sky as seen from the surface ranges from a rather intensive red in the city at dusk to a bright orange. The desert known as the Forge has this orange sky too, with a bit more red than in "Star Trek IV" and in Tuvok's vision in VOY: "Persistence of Vision". The portion of green light in this sky still seems to be too high for a red planet whose surface is not predominantly red. 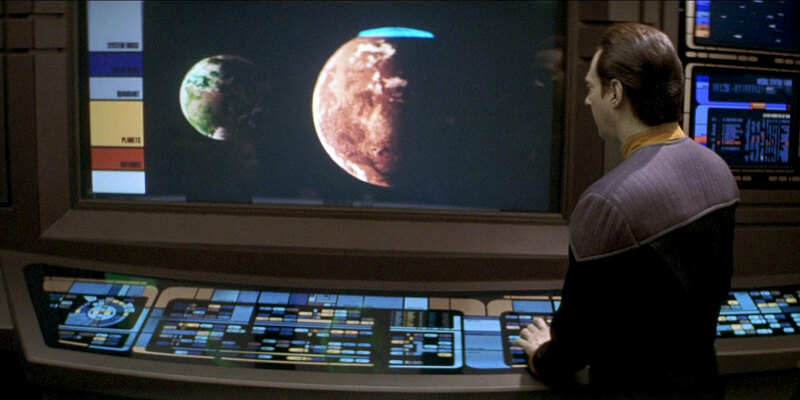 Yet, rather than in "Star Trek III" we could envision that much of the green is filtered out from the reflected light again, explaining why the planet as seen from orbit is not only darker than the surface but has also (relatively) more red in it. 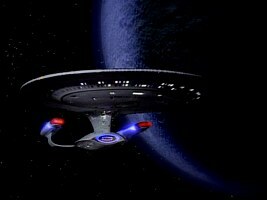 Also, the color of Vulcan and particularly of the Forge as shown in Enterprise is largely consistent with TAS: "Yesteryear". 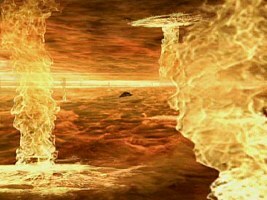 Vulcan in ENT: "The Forge"
Vulcan surface in ENT: "The Forge"
Aside from the visual evidence of the later episodes of Enterprise, ENT: "Strange New World" has a reference to Vulcan's sky. Archer climbs off the shuttle that has just landed on the planet that will later bear the name Archer IV and looks up into the bright blue sky. He asks T'Pol, "Does the sky ever get this blue on Vulcan?" She tells him, "Occasionally." This is in contradiction to all pictures of the Vulcan sky, unless T'Pol vastly exaggerates the blue portion of the light. 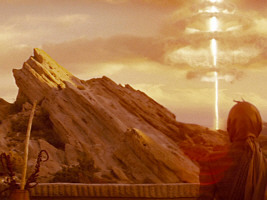 In "Star Trek (2009)" Vulcan, as long as it is still intact, has a blue sky at daytime. 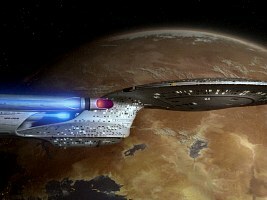 "Star Trek (2009)" writers Kurtzman and Orci explain that the color change may be seasonal. Still, if the color of the sky has something to do with seasonal concentrations of dust in the atmosphere (with yellow or red indicating pollution), we have never seen such a clear sky in 40 years of Star Trek, and ironically over one of the presumably most populous cities of the planet. 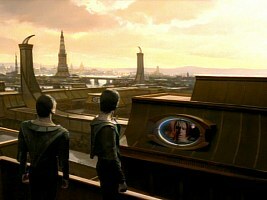 When Amanda is watching Nero's drilling beam from her house, the sky is yellow though. 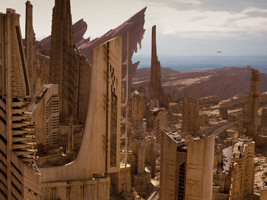 View of Vulcan city in "Star Trek (2009)"
View from Sarek's house in "Star Trek (2009)"
The sky is blue again briefly later when Spock beams down to rescue her and Sarek. 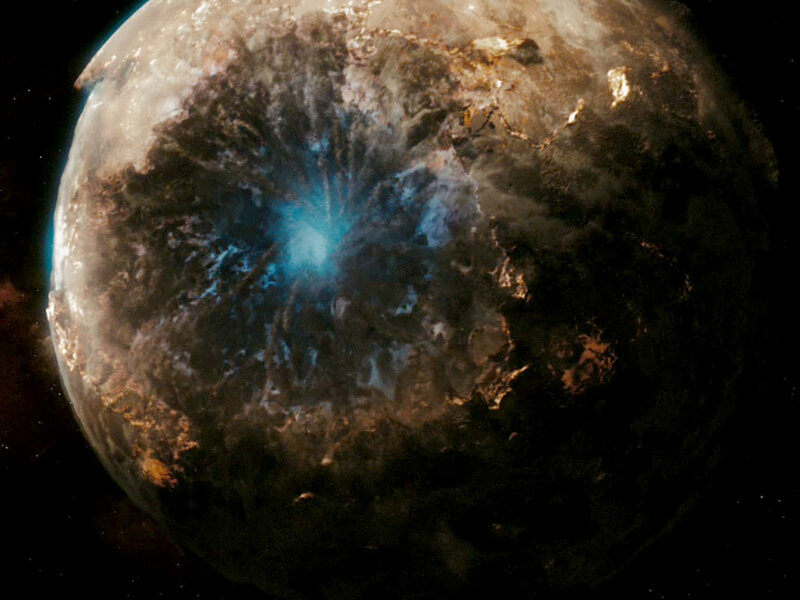 This leaves two possible interpretations: The yellow color may indicate dusk, much like on Earth, or it is a dust cloud as a side effect of Nero's ongoing drilling. 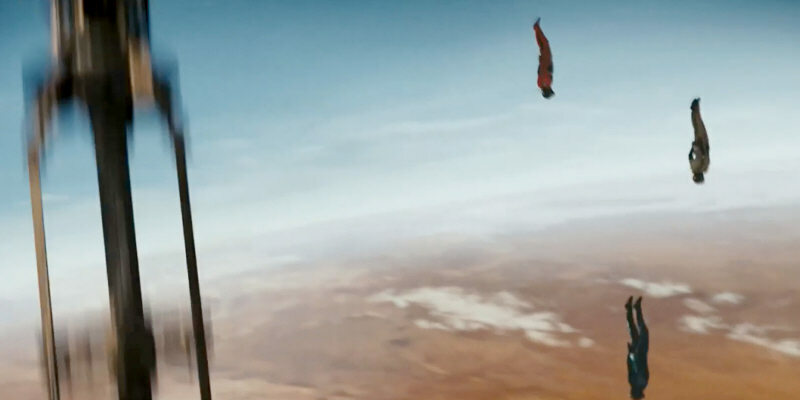 In any case, we have a second incidence in the same movie that the sky is blue. 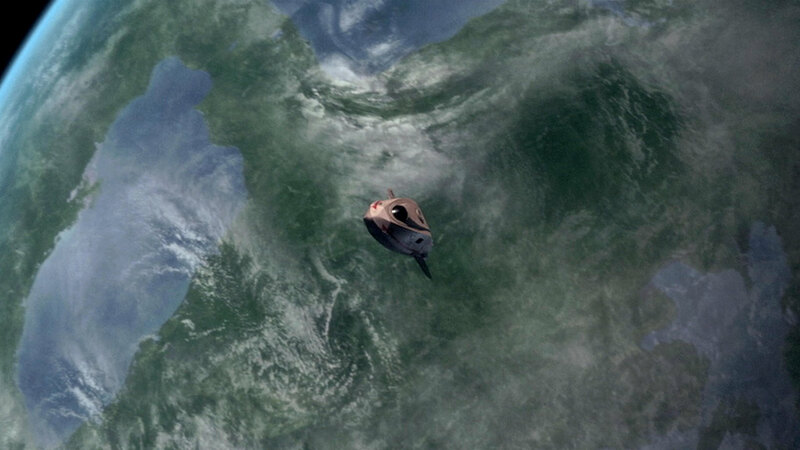 The sky is also blue as seen from space, as it is visible when Kirk, Sulu and Olson dive down to disable the drill. 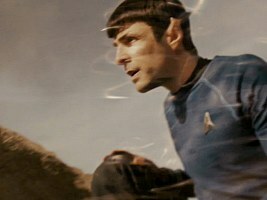 Spock and blue sky in "Star Trek (2009)"
Blue sky from space in "Star Trek (2009)"
The surface of Vulcan appears in various shades of reddish brown. 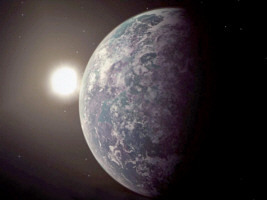 Considering that we look at it under very different lighting conditions (from the surface at bright daylight, from space though many kilometers of atmosphere, during the drilling with a yellow beam and finally as dust clouds are already in the sky), the depiction is in line with previous appearances of the planet surface. We see the entire planet from space when it implodes after the release of the "Red Matter". The color appears to be rather ochre to gray here, almost like in the TNG episodes. But much of this overall impression is attributed to the dust clouds. Maybe the deeper layers of the Vulcan crust are rather gray than reddish. 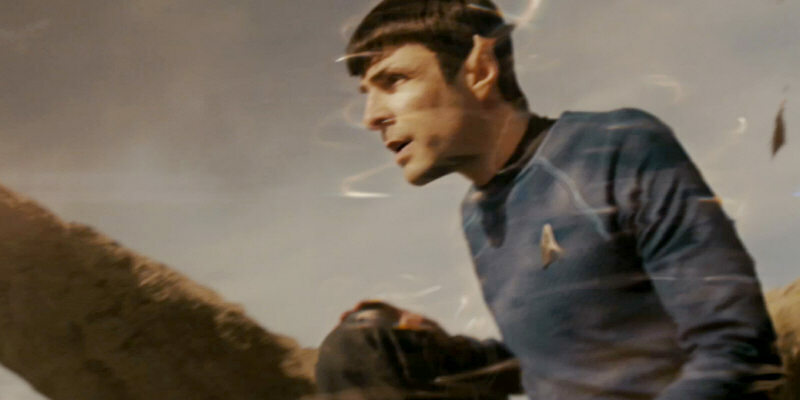 Vulcan implodes in "Star Trek (2009)"
Summarizing, Vulcan has changed very much in the almost 40 years from TOS to Enterprise, TOS-R and finally the reboot movie. Many of the divergences can be explained rather easily considering different weather conditions or times of the day on the planet's surface due to which the color of the sky may vary from dirty beige (cloudy) over plain red (dusk/dawn) to bright orange (noontime in the desert). 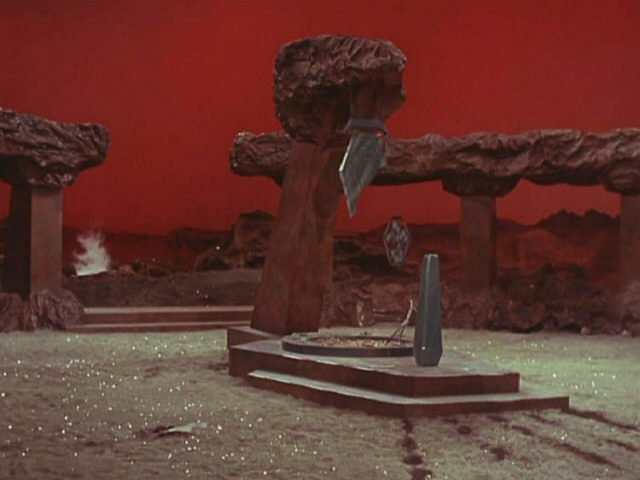 The planet of TOS is definitely too intensely and too homogenously red, but we may attribute that too visual shortcomings of the time. Only the overall dirty ochre TNG planet can hardly be reconciled with the red/orange versions of TOS, TAS, the movies, Enterprise and TOS-R, although in the remastered version it includes oceans like they appeared in Enterprise. 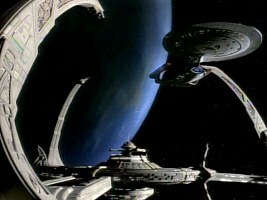 We can see the Klingon homeworld Qo'noS in TNG: "Sins of the Father" and "Redemption". 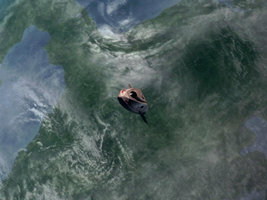 The planet looks very much like Earth from orbit, but the atmosphere forms a green seam rather than a blue one. 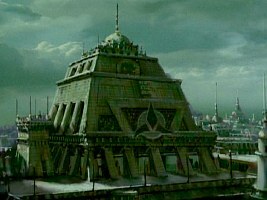 This impression matches with the color of the sky above the Klingon capital, which is greenish as well in the TNG episode. 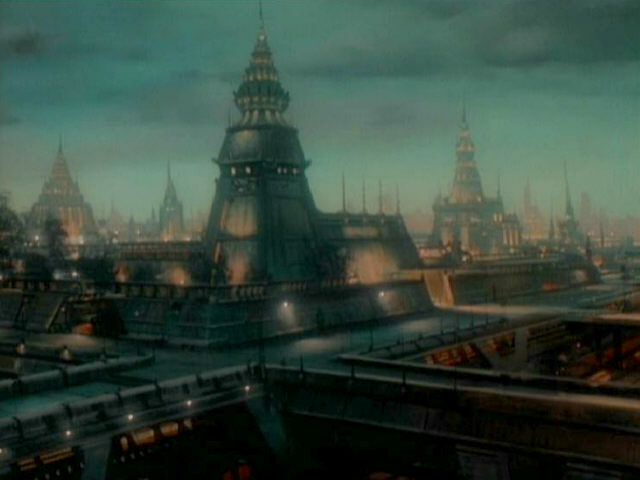 One of the two matte paintings depicts the capital in comparably bright daylight, the other one at dusk/dawn or in dim light because of the dark clouds. Under both conditions the sky looks greenish. 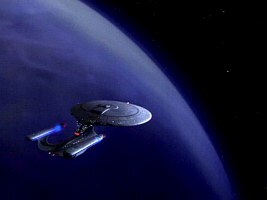 Qo'noS in TNG: "Sins of the Father"
Qo'noS surface in TNG: "Redemption"
A new digital planet model appears in TNG-R: "Sins of the Father". 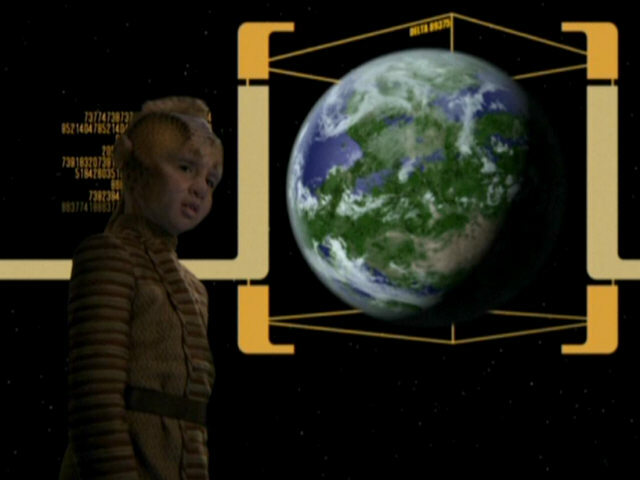 The new planet closely follows the lines of the one of the original episode. The colors are practically the same. 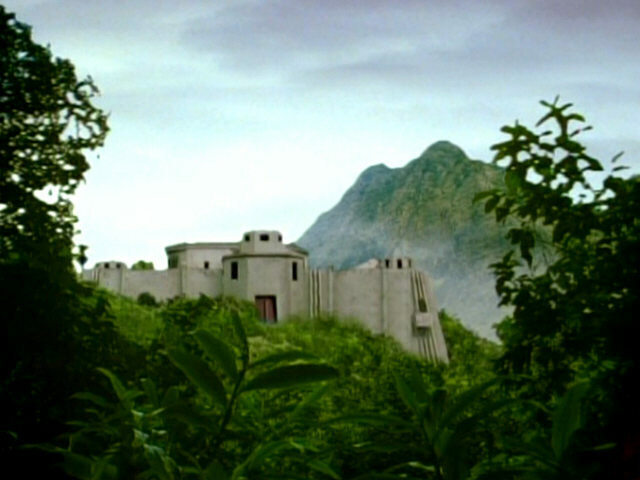 Qo'noS in TNG-R: "Sins of the Father"
In DS9: "The House of Quark" the green hue of the sky is gone, although the identical matte painting as in TNG is used and we should assume the lighting conditions to be the same as back then. Perhaps the color change is attributed to pollution. 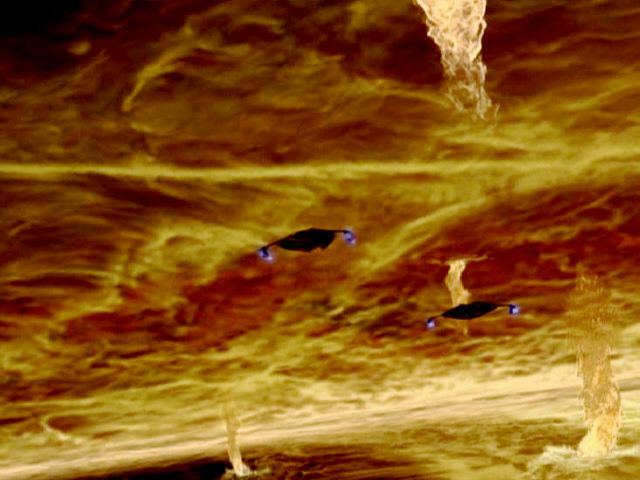 It is possible that many ships and shuttles have left greenish plasma trails in the sky during the eventful days of TNG: "Redemption" (although not a single vessel is visible on the two according matte paintings). 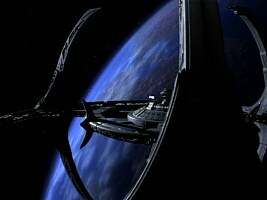 Qo'noS surface in DS9: "The House of Quark"
In ENT: "Broken Bow" we can look at Qo'noS from the orbit again. 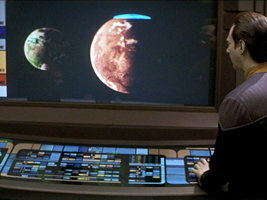 Although the colors are not as intensive by far as in TNG, it is plausible that it could be the same planet. Most importantly the seam of the atmosphere is green again. On the other hand, we have the surface of Qo'noS from "Broken Bow" as well as the holographic simulation created by the Xyrillians from "Unexpected" (which the captain of the Klingon battlecruiser was quite content with). Here the sky is definitely blue. 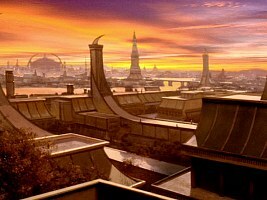 Moreover, the city that is apparently supposed to be the Klingon capital in "Broken Bow" is definitely not the same as in TNG and DS9. Qo'noS in ENT: "Broken Bow"
Qo'noS surface in ENT: "Broken Bow"
Qon'oS surface in ENT: "Unexpected"
It may be possible to explain away the color variations of Qo'noS with a combination of industrial pollution and different natural lighting conditions. There is, however, one alternative that shouldn't be completely ruled out: The Qo'noS of TNG may not be the same planet as the Qo'noS from Enterprise! 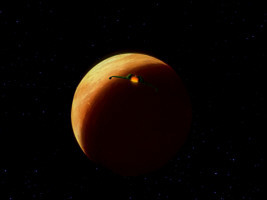 There is evidence in "Star Trek VI: The Undiscovered Country" when the explosion of the moon Praxis causes a pollution of the planet's ozone layer. 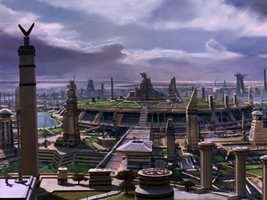 In the following the evacuation of Qo'noS is being discussed in Starfleet because it would become uninhabitable within 50 years. 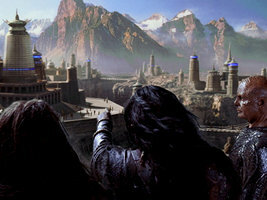 The Klingons most likely wouldn't call both planets by the same proper name "Qo'noS". On the other hand, if "Qo'noS" means just something like "homeworld", this is absolutely possible, and it would be in line with Worf just calling it "homeworld" in early TNG until the planet got its name in "Star Trek VI". Yet, it would be more straightforward to assume that Qo'noS recovered from the pollution, and that the color change may have to do with the technical procedure to clean the ozone layer. 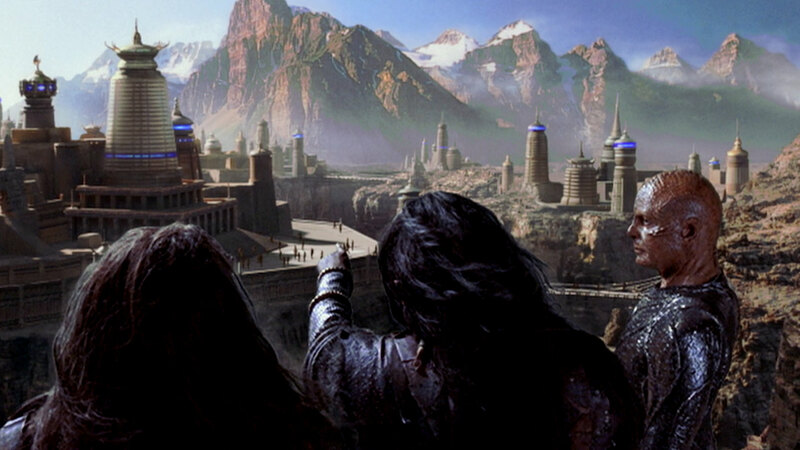 In either case we would need to add to the explanation that the Klingons have moved their capital much like it was obviously done on Romulus. 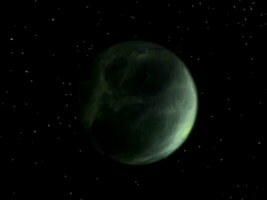 Romulus is a greenish planet as seen in DS9: "Inter Arma Enim Silent Leges", while the sky above Romulus is blue in TNG: "Unification". The explanation may be the same as with Qo'noS, that the lighting conditions and the degree of pollution may influence the color of the sky. 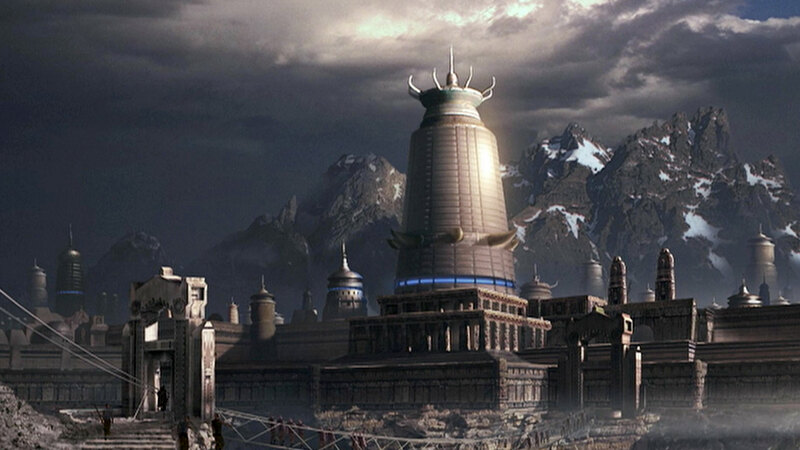 But actually no explanation is necessary for that, as Romulus consistently has a blue sky as seen from the ground. In both episodes we can witness how the sky turns red just like on Earth at dusk, using the matte painting first seen in the TNG episode. The TNG matte painting shows a large city with some areas covered with green or water. The most prominent feature is a large circular structure on the top of which several smaller buildings are located. 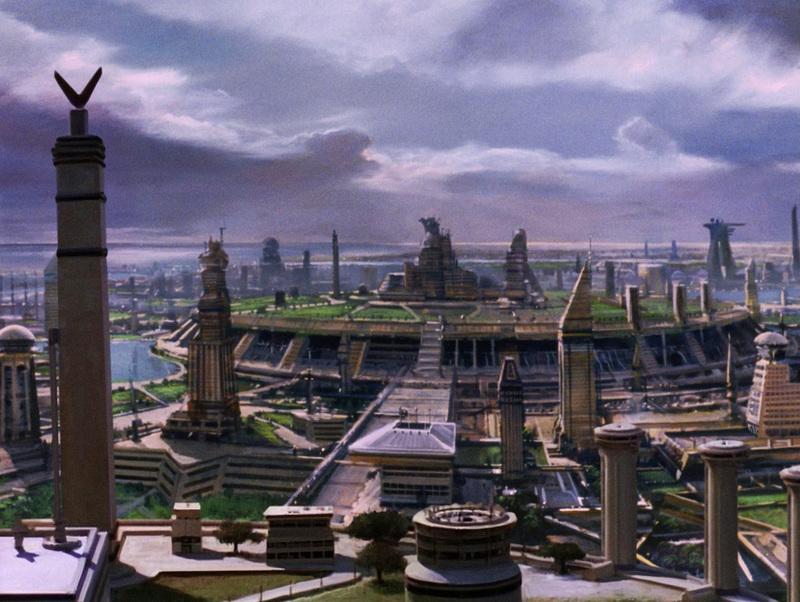 Although it was never hinted at, this is obviously the government center with the Romulan Senate. 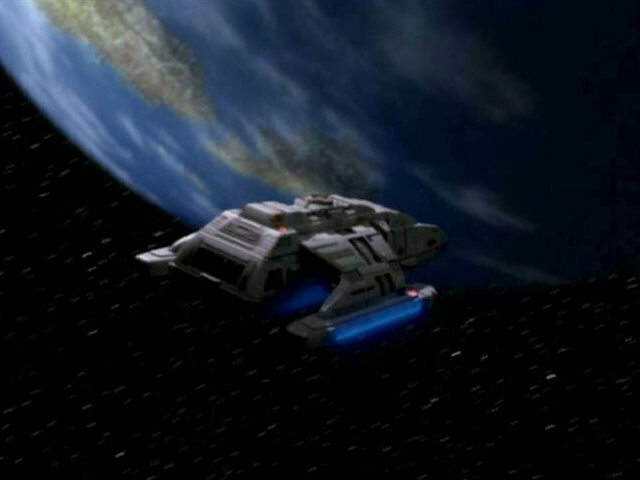 Romulus in DS9: "Inter Arma Enim Silent Leges"
Romulus surface in TNG: "Unification"
Romulus surface at dawn in DS9: "Inter Arma Enim Silent Leges"
In "Star Trek Nemesis" we can see the planet from space as well as on a display along with Remus. 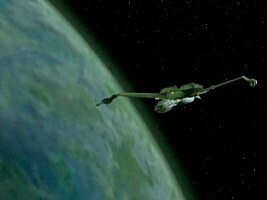 On both occasions Romulus is rather blue than green, but this doesn't clash with the DS9 appearance. 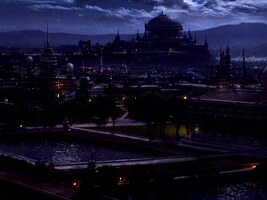 The sky above the capital is blue like already in TNG. The same CGI model as in "Nemesis" is used in ENT: "Babel One" to represent the capital. 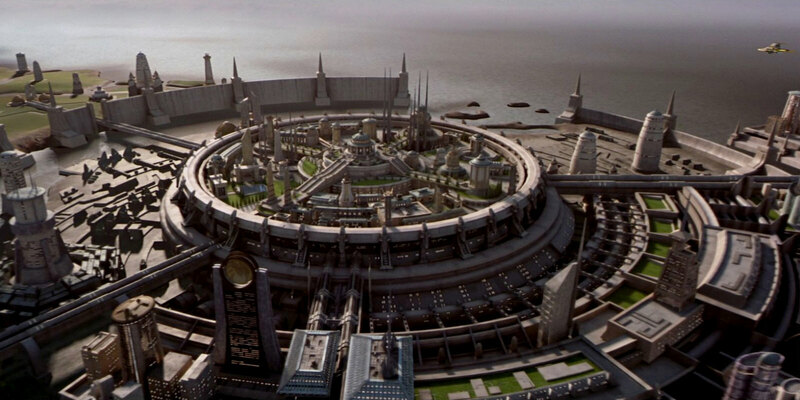 Romulus in "Star Trek Nemesis"
Romulus on a display in "Star Trek Nemesis"
Romulus surface in "Star Trek Nemesis"
Yet, there is one substantial difference: The capital obviously isn't the same any longer as in TNG and DS9. 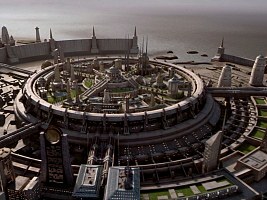 In "Nemesis" it is a CGI model with a round building for the Romulan Senate in the center. 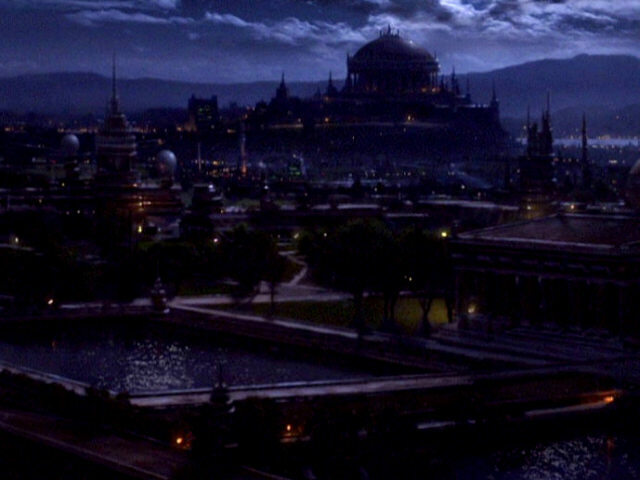 This CGI version overall resembles the matte painting from the TV series, but it exhibits substantial differences. While the massive ring-shaped structure is essentially identical, not a single of the other buildings is the same. 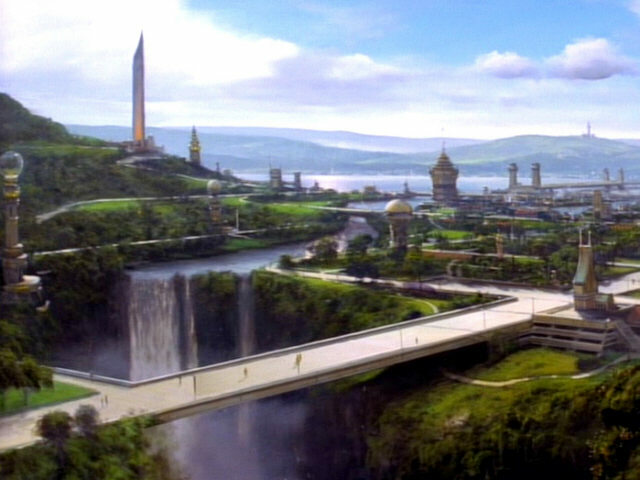 In addition, the city is now located next to the sea or a very large lake, which is not the case in TNG where we see just a small portion of water. Overall, the "Nemesis" version looks small and cozy compared to the metropolis of TNG and DS9. 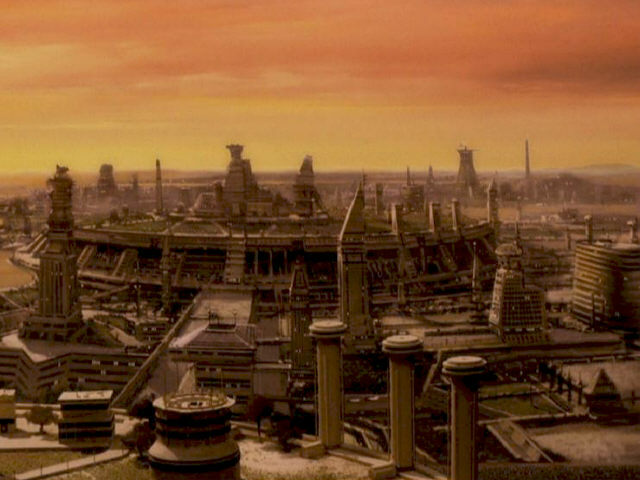 The fact that in Enterprise, more than 200 years earlier, the city is the same as in "Nemesis" ultimately suggests that the place shown as the government center has not been the same all the time. Either the Romulans have moved their capital, or they have government buildings in different places (although otherwise the Romulan Empire appears to be very centralized). 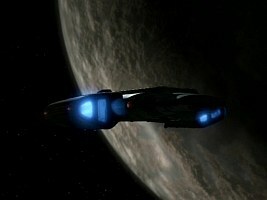 The appearance in Enterprise aggravates the problem, for we wouldn't expect everything to look exactly the same for such a long time. 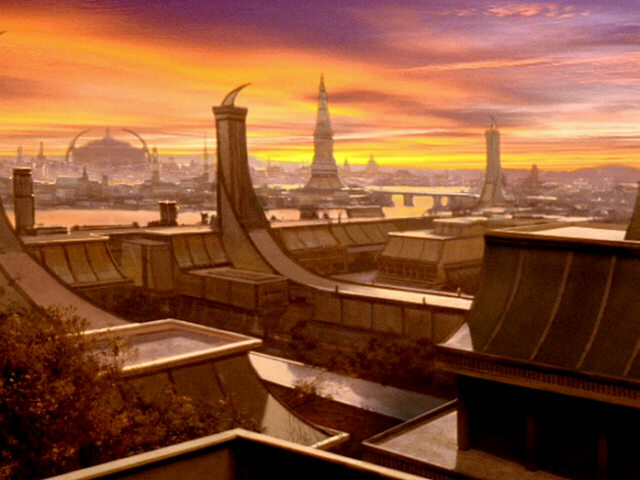 However, it may corroborate the idea of a distributed capital like in the Netherlands or in South Africa: one traditional city (Enterprise, "Nemesis") as the seat of the parliament, the Romulan Senate, while the executive power resides in the metropolis seen in TNG and DS9. 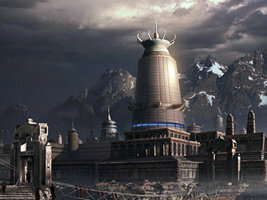 Alternatively, we may looking at two different centers in the same city, but considering the distinctiveness of the large ring compared to the rest of the buildings it may be rather something like a Russian Kremlin, of which there used to be one in every important city. 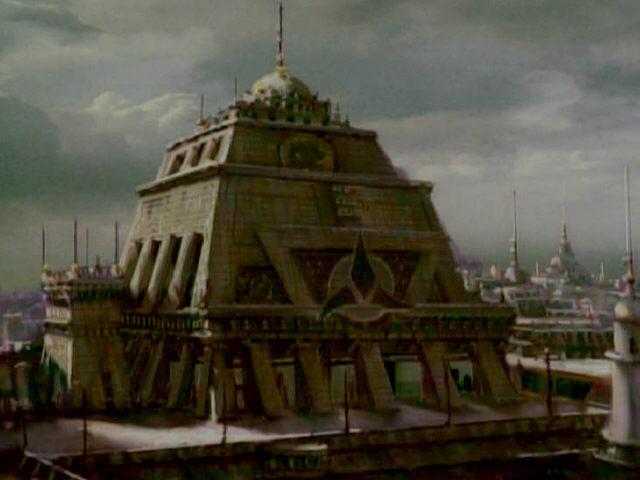 Irrespective of the solution to the dilemma it would not be far off to acknowledge that Romulan architecture is likely the same everywhere, much like in the Roman Empire and other cultures that have developed consistent building patterns. In "Star Trek (2009)" there is only a brief glimpse of the planet Romulus, before it is obliterated by the Hobus supernova. We can only see that planet is greenish again, like already prior to "Nemesis". Romulus in "Star Trek (2009)"
The appearance of the very Earth-like planet Bajor is quite consistent throughout the seven seasons of DS9. 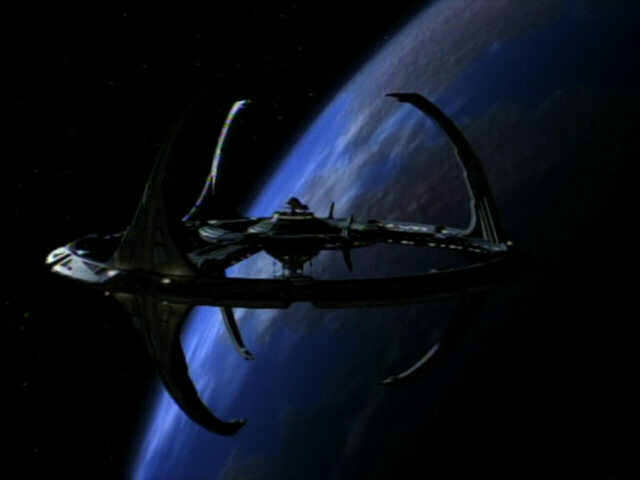 The model of the planet initially created for DS9: "Emissary" appears repeatedly without visible modifications. 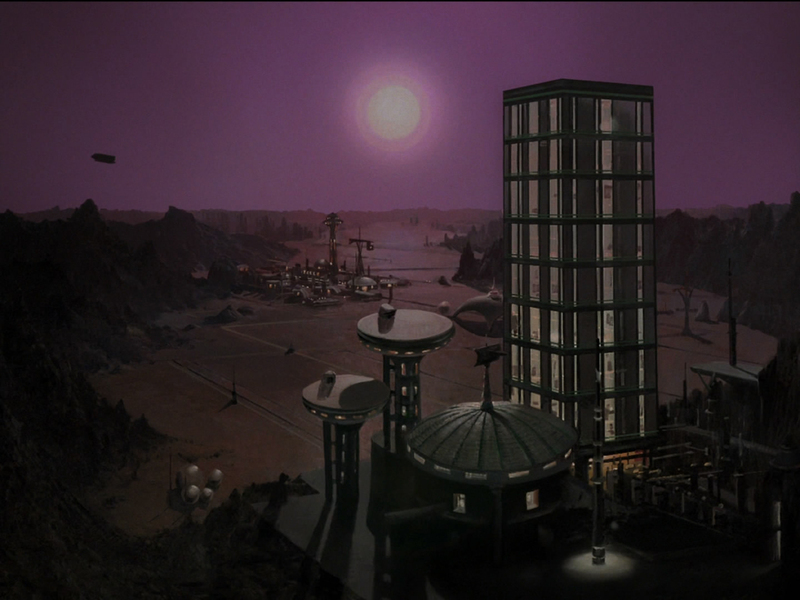 The extensive use of stock footage corroborates the impression of a consistent look of Bajor. For instance, a scene of a runabout that approaches Bajor from "below" was initially created for DS9: "Babel" and reappeared in "The Storyteller", "Rapture", "The Darkness and the Light" and possibly in even more episodes. Likewise, the takes of Terok Nor in orbit of Mirror Bajor or of Bajor in the past are essentially all the same. 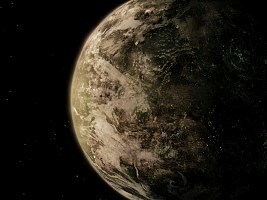 Mirror Bajor in DS9: "Crossover"
Bajor in the past in DS9: "Wrongs Darker Than Death or Night"
While all shots of the original planet model show Bajor's atmosphere in plain blue and the continents mostly brownish, the CGI planet created for "Shadows and Symbols" has an overall greenish hue, giving the land areas lusher vegetation and the oceans a turquoise color. Overall, however, this change is not really significant. CGI Bajor in DS9: "Shadows and Symbols"
Bajor's sky is very consistent. It seems that it was created using shots of Earth's sky, and hence has the same basic appearance with the same natural variations under different lighting conditions. 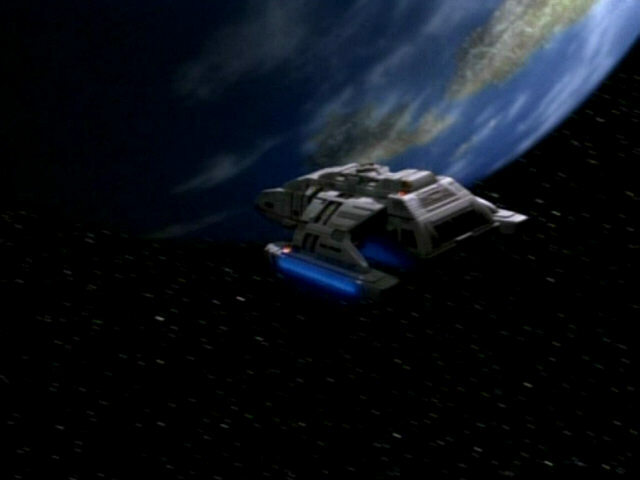 Bajor surface in DS9: "The Storyteller"
Bajor surface in DS9: "The Siege"
Bajor surface in DS9: "Cardassians"
Bajor surface in DS9: "When It Rains"
Cardassia Prime always appears as a brownish planet with comparably small pale blue oceans. There is not really a change to the planet's appearance, but we can see more surface details in the final season of DS9, where obviously a CGI model is being used. 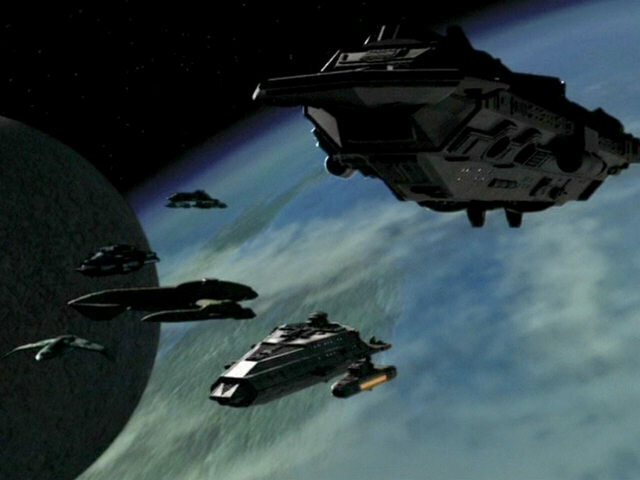 Cardassia in DS9: "Trials and Tribble-ations"
CGI Cardassia in DS9: "The Dogs of War"
CGI Cardassia in DS9: "What You Leave Behind"
The appearance of Cardassia as seen from the surface is quite consistent as well, owing to the use of stock footage. The sky appears to be ochre and comparably dim even at daylight, maybe due to pollution. At dusk portions of it turn red and purple a bit like above densely populated and industrialized cities on Earth. Cardassia at daylight in DS9: "Second Skin"
Cardassia at sunset in DS9: "What You Leave Behind"
Risa first appears in TNG: "Captain's Holiday" as a holiday resort that Riker recommended to Picard. The planet as a whole, with the deep blue color of the oceans and the large Africa-like continent, looks very much like Earth as seen from space. There are no clear shots showing the planet's sky. 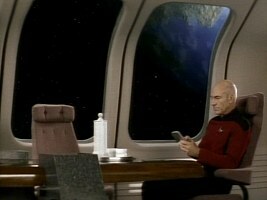 The opening scene of TNG: "The Game" takes place on Risa, but we only see the interior of Riker's hotel room. Risa in TNG: "Captain's Holiday"
A new digital planet model appears in TNG-R: "Captain's Holiday". 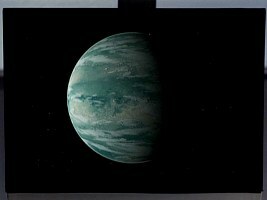 This planet looks a bit more like it does in ENT: "Two Days and Two Nights", with its turquoise oceans. 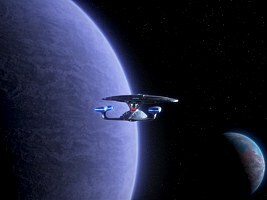 Risa in TNG-R: "Captain's Holiday"
The planet is again visible in DS9: "Let He Who Is Without Sin". 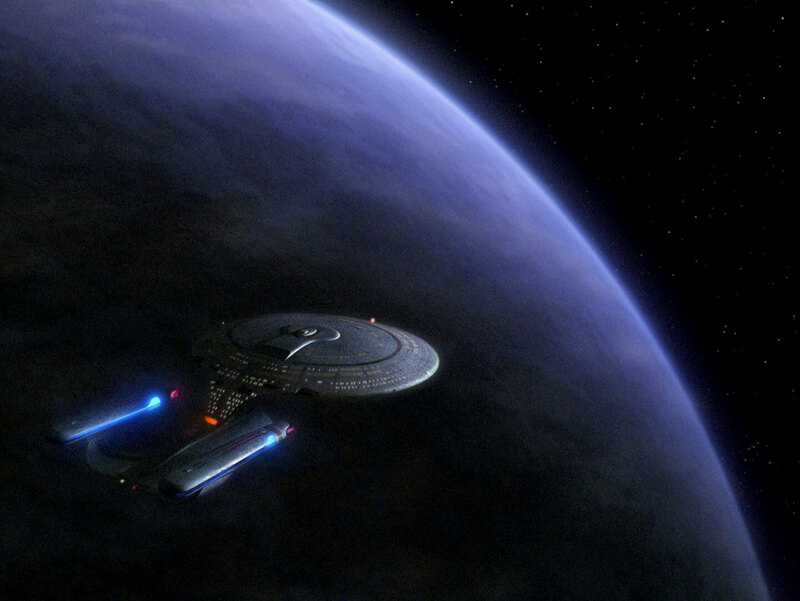 Here we can see the planet from space too, perhaps with a slightly different hue but overall the same as in TNG. Actually, the shot originally depicted the planet Bajor (see also above) and was simply left-right reversed. 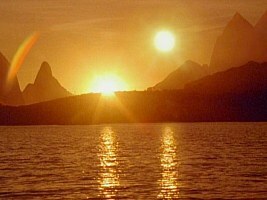 We also see from the surface that Risa apparently has two suns. Risa in DS9: "Let He Who Is Without Sin"
Risan sky in DS9: "Let He Who Is Without Sin"
Risa appears once more in ENT: "Two Days and Two Nights". This time the color of the planet in space is different, the seas are rather turquoise than blue. 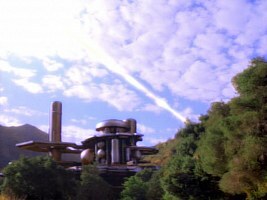 Also, there seems to be more vegetation than especially in TNG. 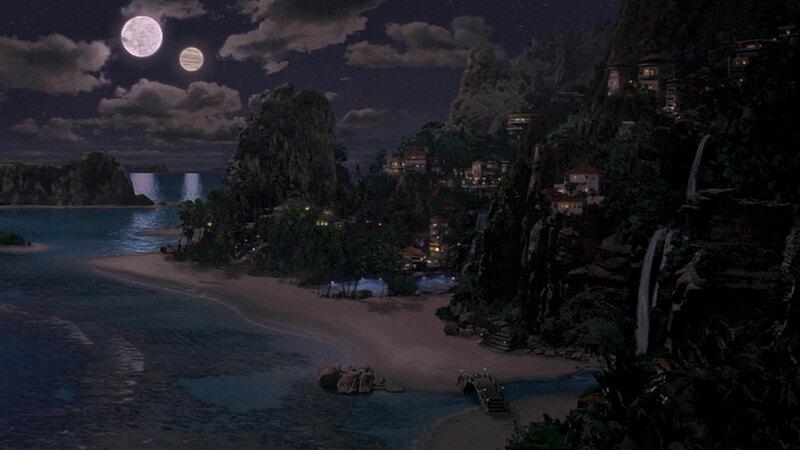 Perhaps ENT shows the tropical zone of the planet, and the oceans are very shallow in this region, like huge lagoons? From the surface we can see two moons. In a cut scene from ENT: "Fallen Hero" T'Pol states that Risa is a "Minshara-class planet with three moons." Risa in ENT: "Two Days and Two Nights"
Risan sky in ENT: "Two Days and Two Nights"
The planet as it appeared in the originally unaired pilot episode "The Cage" and once again as stock footage in TOS: "The Menagerie" was created using Earth's moon and superimposing a cloud pattern. This was fixed in the remastered episodes. 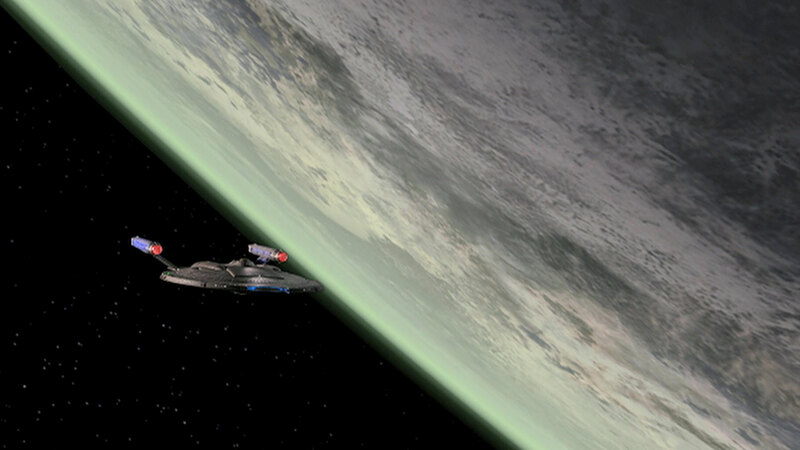 TOS-R: "The Menagerie" was produced first, and here we can see a new CGI model of Talos IV in more natural pale colors. TOS-R: "The Cage" was remastered later, and although the new planet from TOS-R: "The Menagerie" was still available, it was decided to create a new one. 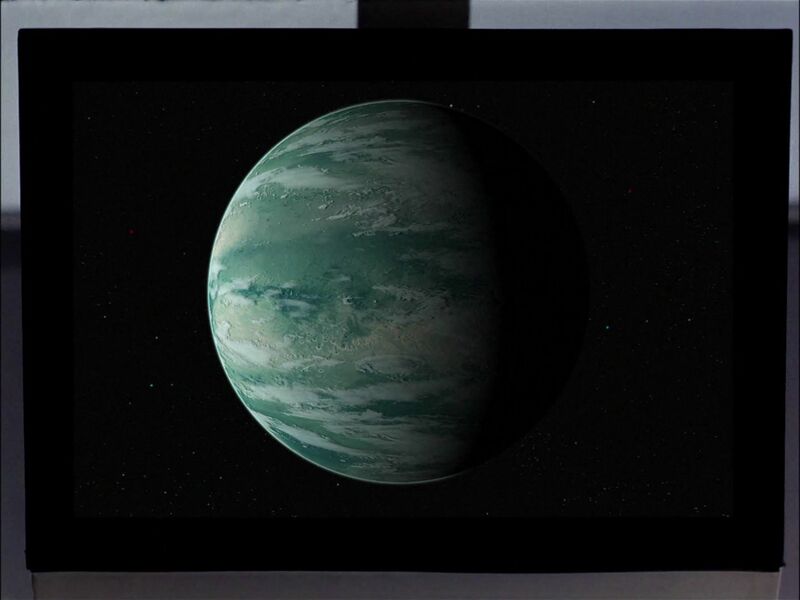 This new planet is somewhat more detailed, and also the cloud patterns and the now overall turquoise color are different. 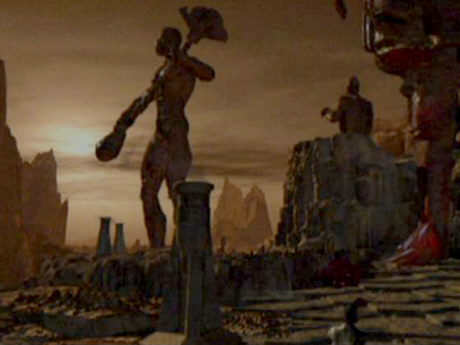 Talos IV in TOS-R: "The Cage"
Talos IV in TOS-R: "The Menagerie"
The planet on which Starbase 11 is located never received a name. We can see it in TOS: "Court Martial" and some time later in TOS: "The Menagerie", both times represented by the same blue marble, Planet 1b in our classification. For TOS-R: "The Menagerie", one of the first episodes to be remastered, the new CGI planet was given a lilac hue from space, to match the color of the sky as seen from the surface. 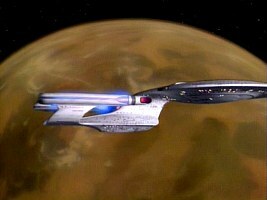 TOS-R: "Court Martial" was produced later, and another new model was built. The color is still lilac, but in some shots as seen on the Enterprise's main viewer the oceans are plain blue (perhaps the screen uses a special filter that cancels out atmospheric light scattering?). 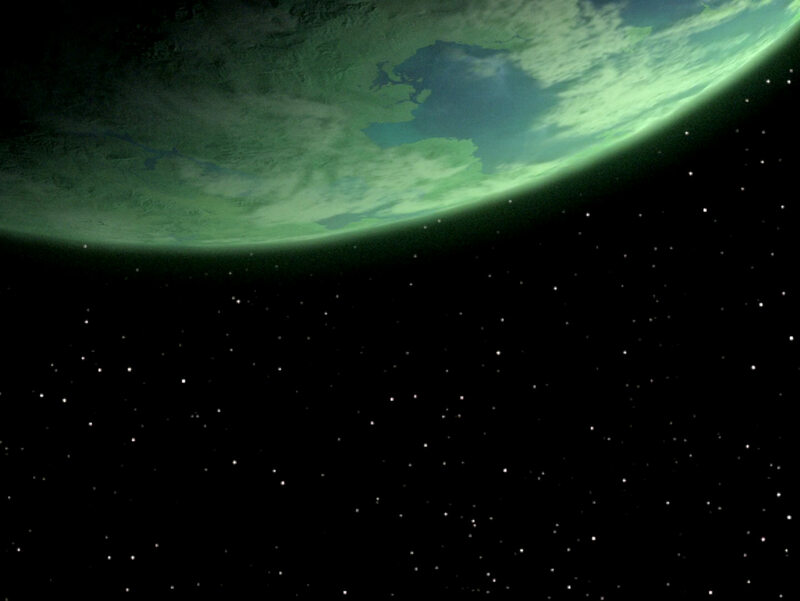 Also, the new planet is somewhat crisper in all shots. Finally, the continents are likely not the same any longer, but we never see enough of the planet to reconstruct its surface. 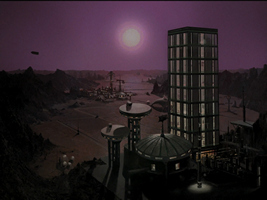 Starbase 11 planet in TOS-R: "Court Martial"
Starbase 11 planet in TOS-R: "The Menagerie"
The planetscape showing Starbase 11 is the same in both TOS-R episodes, and closely follows the one established in TOS with its lilac to purple sky colors, while correcting some perspective and daylight timing errors. Starbase 11 surface in TOS-R: "Court Martial"
Starbase 11 surface in TOS-R: "The Menagerie"
The green planet Krios in TNG: "The Perfect Mate" is totally different than the blue look previously established in TNG: "The Mind's Eye". 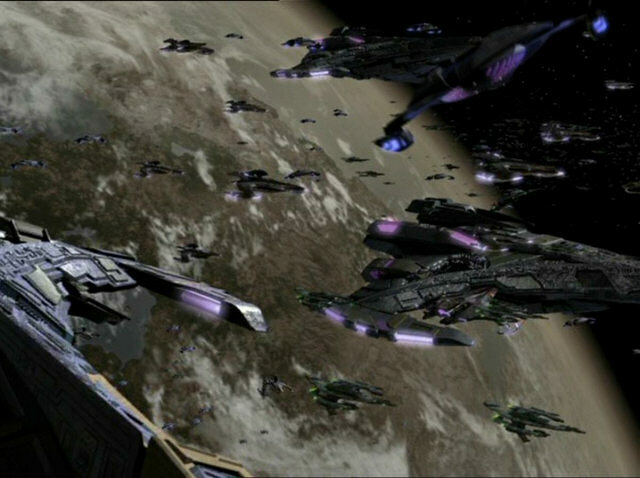 This coincides with another inconsistency pertaining to Krios, that in "The Mind's Eye" it was said to be a Klingon colony, while in "The Perfect Mate", one season later, it is meant to be an independent alien world. 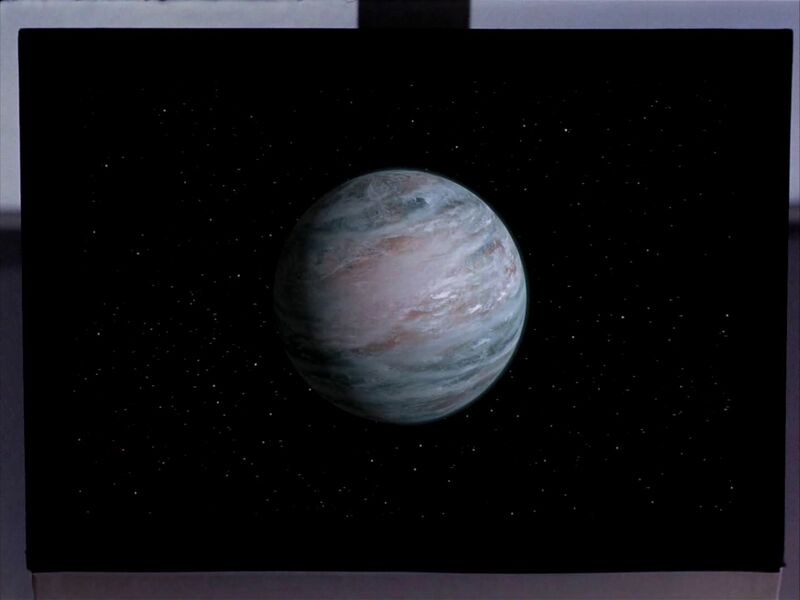 Perhaps in one of the two episodes we don't see the actual planet but a moon? Or are there really two different planets? Krios in TNG: "The Mind's Eye"
Krios in TNG: "The Perfect Mate"
Galorndon Core fist appears in TNG: "The Enemy" as the hostile planet where Geordi has to cooperate with a Romulan to survive. Here the planet is blue. 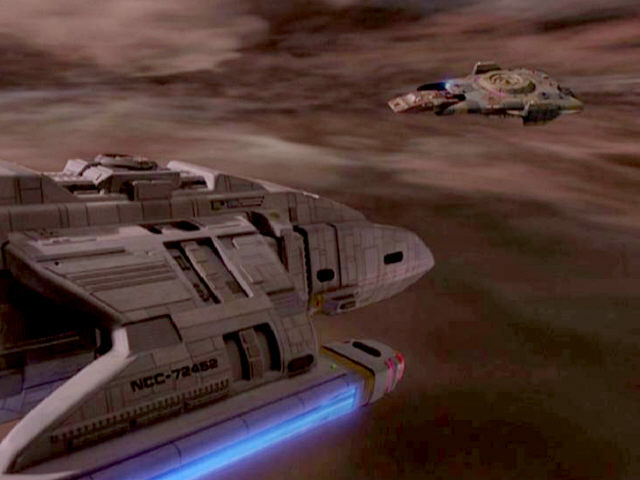 The Enterprise visits the planet again in TNG: "Unification, Part II", but now Galorndon Core is mostly brownish, although there are still some bluish portions. Ironically we can see the same shots of the Enterprise in the planet's orbit in the two episodes, only that the planets are different! The shots from "Unification" are actually stock footage of Peliar Zel II from TNG: "The Host", with the planet's Alpha Moon being visible on the right side on the first and the Beta Moon at the upper edge of the second screen cap. Galorndon Core in TNG: "The Enemy"
Galorndon Core in TNG: "Unification, Part II"
Perhaps the dissimilarity of the two versions of the planet could be a matter of (seasonal?) atmospheric conditions and of the lighting though. In "The Enemy" it is a part of the story that Galorndon Core is being ravaged by electromagnetic storms. 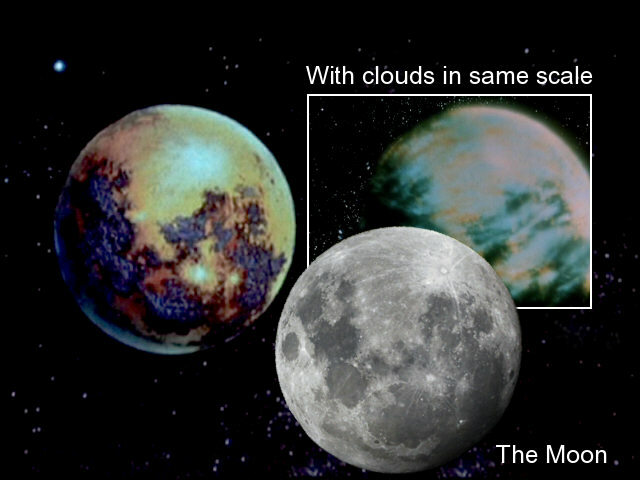 And indeed, this complies with the dense, apparently 100% cloud cover that we can see, although we are shown the very same blue cloudy planet on several more occasions where they usually represent nice Earth-like worlds. Well, and the blue color is rather unrealistic considering how the clouds would obscure any look at the planet's surface and possible oceans just as well as they would absorb the blue light rather than other portions. 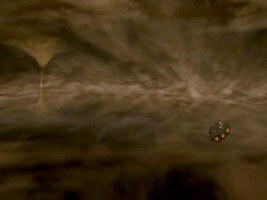 Anyway, in "Unification" we can see once again a cloudy planet, and its brownish hue seems to indicate that the clouds are at least partially composed of dust. It is well possible that the dust concentration in the atmosphere is subject to vary, or that it may become apparent only under certain lighting conditions. Only the fact that there are several other blue planets just like Galorndon Core in "The Enemy" and also some other brownish planets just like the "Unification" version is still inconsistent. 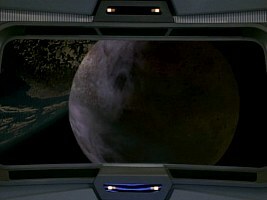 The planet in TNG-R: "The Enemy" is a new one (or was digitally retouched). The blue color is far less intense in TNG-R. The same new planet can be seen in TNG-R: "Unification II" as well, eliminating the visual inconsistency between the two original episodes. 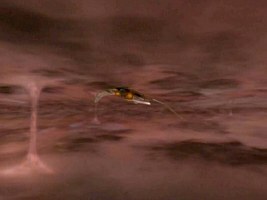 Golorndon Core in TNG-R: "The Enemy"
Galorndon Core in TNG-R: "Unification, Part II"
We see a small portion of the planet Talax behind the moon Rinax in VOY: "Jetrel". 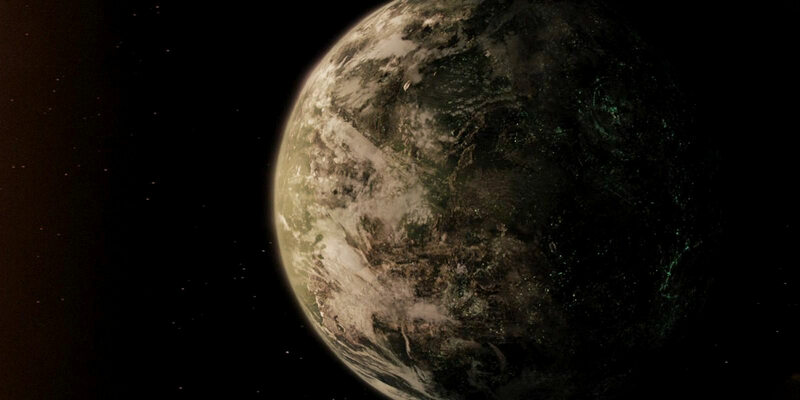 Although it is quite dark, Talax appears to be a very Earth-like planet with blue and green being the dominating colors. In VOY': "Homestead" we see Talax again, albeit just on a display. This planet has much more intense blue/green colors. Yet, we could imagine that it is the same as in "Jetrel". The Badlands are a region of space where plasma eddies and other unpleasant anomalies are commonplace. 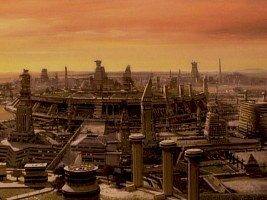 But despite this rather coherent bad reputation of the Badlands, the look of this region, just like of the above planets, was subject to vary considerably during the run of DS9. The following analysis is strictly chronological in the order of airing, and it shows us a clear tendency in which direction the visual effects developed. In DS9: "The Maquis, Part I" the Badlands appear to be just an airy nebula through which the stars are still visible. The characteristic plasma eddies make their first appearance in VOY: "Caretaker", the only time that the Badlands can be seen in a Trek series other than DS9. From now on they appear as a dense "storm front" with two layers between which plasma discharges occur. The color here and in the next two episodes is reddish brown. More precisely, the look remains consistent in DS9: "Through the Looking Glass" where apparently stock footage from "Caretaker" is used for the Mirror Universe Badlands. 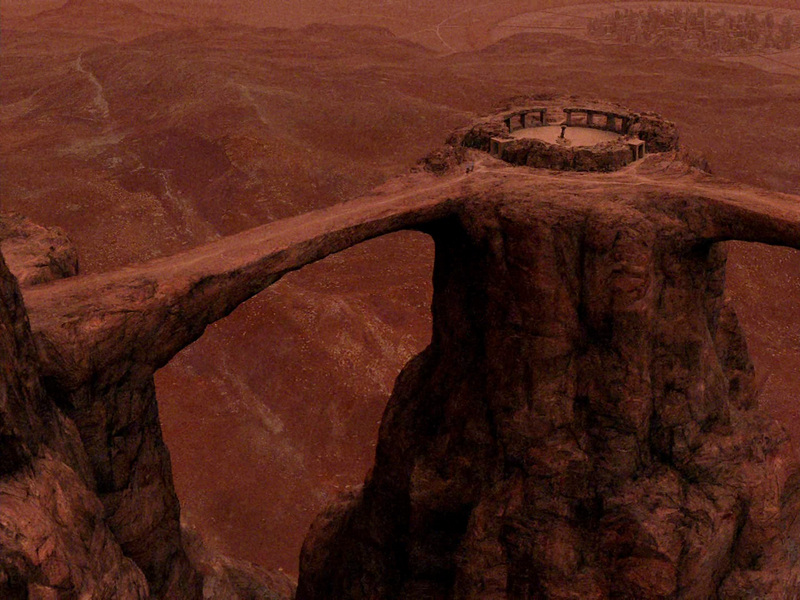 The Badlands still look much the same in DS9: "Indiscretion" as well. Badlands in DS9: "The Maquis, Part I"
Badlands in DS9: "Through the Looking Glass"
A color change takes place for DS9: "For the Cause". While the two cloud layers and the eddies still look essentially the same, their color is now orange brown. The Badlands have a similar look in DS9: "For the Uniform". So far the eddies and clouds used to be dusty. 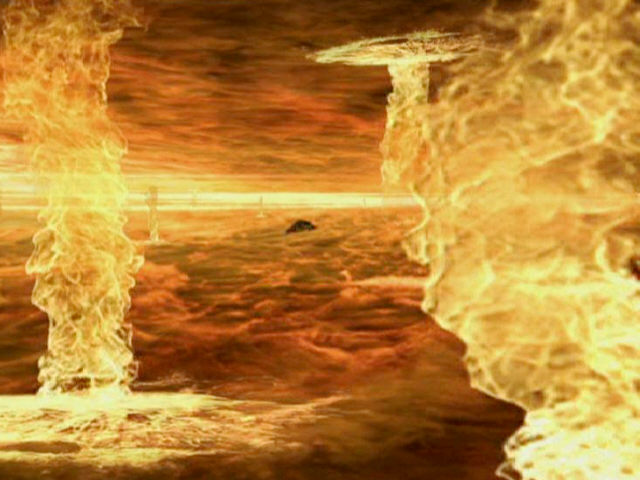 However, in DS9: "Blaze of Glory" and in their last appearance in DS9: "Penumbra" they are suddenly fiery. The final version of the Badlands looks like the inside of a huge building whose floor and ceiling are burning in intense shades of red and yellow. Badlands in DS9: "For the Cause"
Badlands in DS9: "For the Uniform"
Badlands in DS9: "Blaze of Glory"
Interestingly there is a clear development of the look from a simple faint nebula to a much more menacing fiery storm front. Each newly established look remains consistent for at least one more episode. 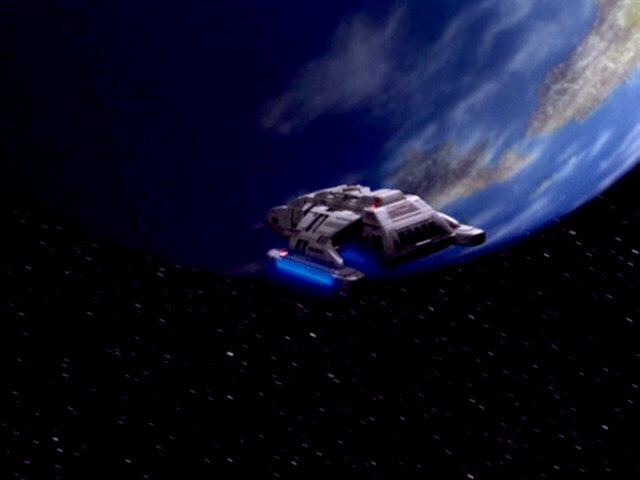 So the simple explanation that we may be looking at different portions of the Badlands (DS9: "The Maquis" could have taken place at the very edge of the region) in the various episodes may not be quite sufficient. A "climate change" in the Badlands throughout the six years that we have visual evidence of it may be an alternative explanation. Other Cartography Inconsistencies - about the size of the Federation, the Rigel system, Vulcan's moon, etc. Some screen caps from TrekCore and Trekmovie.com. 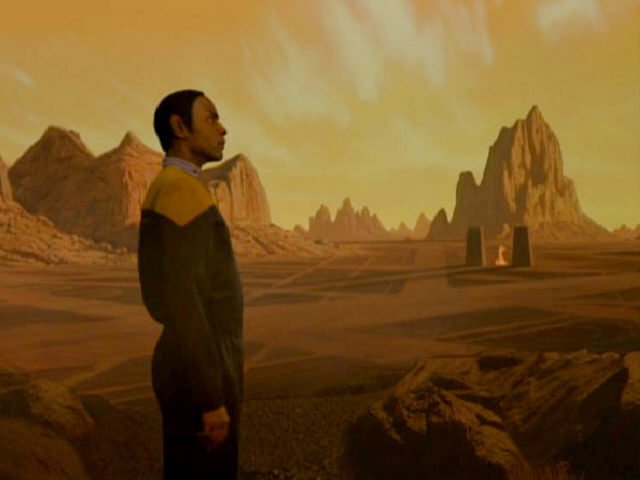 Thanks to Kris Olinger who noticed that the Voyager matte painting of Vulcan was a re-use and to Joshua Fuller for the idea that there could me more than one center in the Romulan capital.